Broken Heart - AA white heart as a background to a zigzag placement of red flowers. 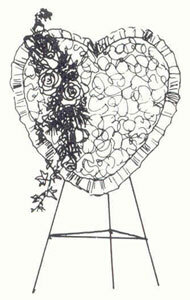 Open Heart - A heart with the inside of the form removed (also in the shape of a heart), often designed with one type of flower and ribbons. 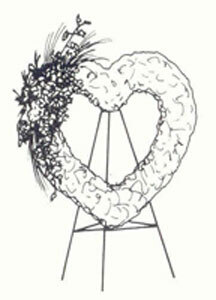 An alternative can be a grapevine heart wreath designed with a flower cluster and ribbons. Needle Pak - A mechanic for set pieces made of pine needles wrapped in serveral layers of tissue on a cardboard base. 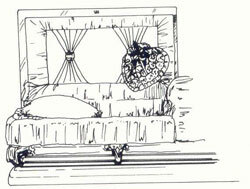 Pillows, wreath bases, and casket saddles are available in this form. The mechanic is frequently used on the West Coast. 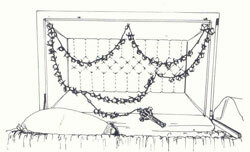 Pall - A fabric piece placed on the casket. 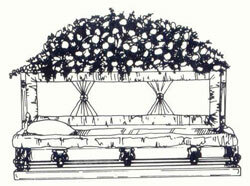 In the south, any design placed on a casket. 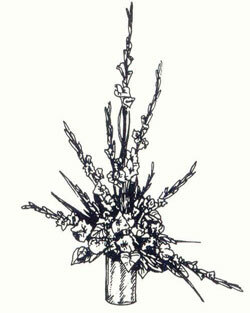 Pedestal Arrangement - Flowers and foliage set in a container; it is designed to be displayed on a pedestal. Pillow - Flowers and/or foliage, usually of one color and variety, imbedded directly into a styrofoam or needle-pack pillow form. 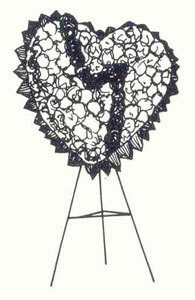 A cluster of flowers is usually placed in one corner of the design, which is displayed on an easel. It may also be called a standing pillow. Rosary - Blooms secured into a rosary form, most often made with rosebuds, usually displayed on or in the casket. Satin Cross, Heart, Pillow - Small set pieces made of satin fabric in the shape of a cross, heart, or pillow; they are usually set inside the casket lid. Set Piece - A design that has a specialized shape or form which is created with floral products and is usually constructed using styrofoam, floral foam, or a moss form as a base. A set piece is usually placed on an easel. Examples: heart, cross, clock, gates ajar, Bible, anchor, harp, empty chair, broken wheel. 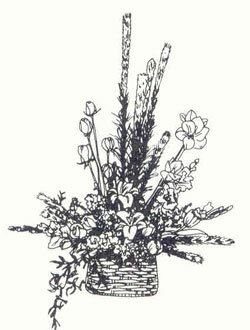 Sheaf - An informal tribute made to look as natural as possible. 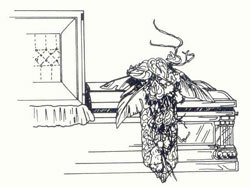 The materials are secured into a central tying point, which is finished with ribbon, leaving the stems exposed below the tie. It is made to tie flat on the casket or grave. 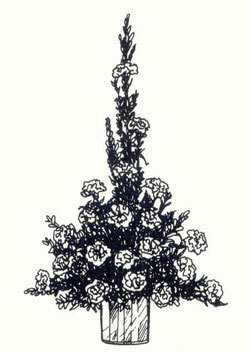 Spray - A one sided flower design, flat on the back side, which can be displayed in various ways, for example, casket spray, easel spray, or flat spray. Easel Spray - A spray designed to be displayed on an easel. It is also referred to as a standing spray. 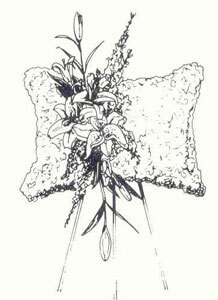 Flat Spray - A triangular spray of greenery with flowers and a satin bow that is often designed in styrofoam. The sprays are often grouped by funeral directors to foam arches, crosses, or other shapes. 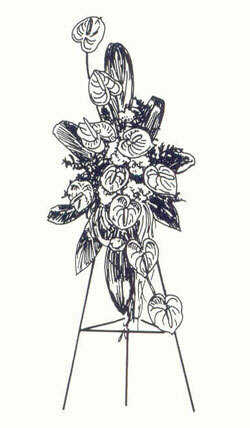 Vase Arrangement - A design palced in a container of ceramic, glass, plastic, metal, or papier-mache. The container's height is twice its width, and does not have a handle. Visitation - A memorial time before the funeral (the day before or immediately before) to express condolences to the bereaved family. 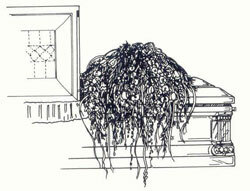 Visitation is often held at a funeral home, and flowers are usually in place at this time. Wake - A visitation, often an expanded length of time, to include a celebration of the deceased person's life. Wreath - A ring or circle of flowers and/or foliage symbolizing eternity. 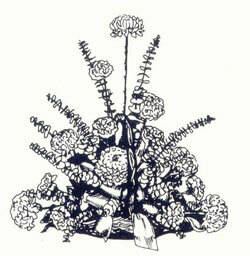 A variation is a ribbon or foliage-wrapped wreath with a flower cluster. Flowers convey a beautiful, living testimony of the sender's respect for the deceased and concern for comforting the living. Flowers speak a silent eulogy during funerals. As in the early days of mankind, flowers continue to play an important role in the sympathy and grieving process.